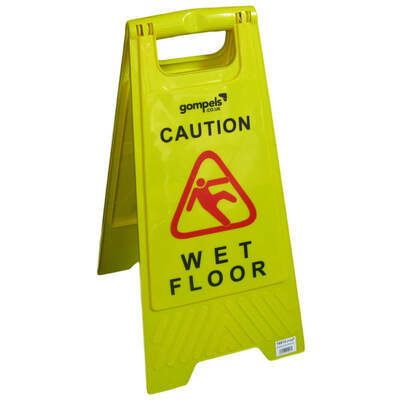 Our Gompels Wet Floor Sign is a practical addition to any working environment. Helping to ensure your business stays compliant with current Health & Safety regulations, this freestanding sign in bright neon yellow is clearly visible to reduce the risk of injury. Durable hard-wearing plastic can be easily cleaned with antibacterial wipes or spray. Here at Gompels, we have a wide range of self-produced Health & Safety signs to benefit your business, including our First Aid Box sign and Caution Hot Surface sign to help navigate your most vulnerable residents. Ensuring every message gets across to all members of your staff has never been easier.